During about 30 years at Camp Bryan and previous experience with the army, Dave served many famous personages. His intimacy with these men gave him the rare privelege of being able to relate about them many interesting anecdotes. The cook used to say the thing he remembered most about Babe Ruth, was the batter's appetite. "No wonder he weighs so much," he would say. "He shore kept me busy cooking. 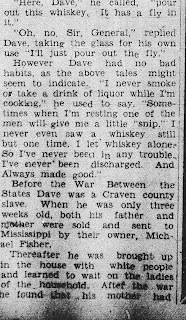 I just couldn't cook him enough collards and corn bread." The obituaries for Dave Sampson were just absolutely wonderful to receive in the mail. My thanks go out to Victor T. Jones jr. at the Kellenberger Room at the New Bern Public Library again. They are filled with so much information and really flesh out who Dave was as a person. It is also absolutely amazing to me that in 1932, a man of color had an obituary that seemed to just go on for days. When I say that, I am referring to the second one. Click on image twice to enlarge. Amazing amount of information in that second novel of an obit! 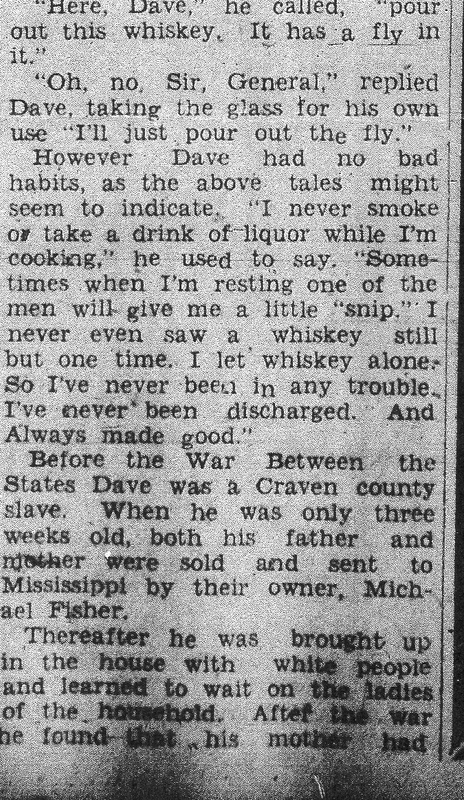 I recently discovered the joys of newspaper articles. I never expected to find such a wealth of information in them. I was glad to find your blog listed in new blogs for June in GeneaBlogger. Immediately I found a Craven/Carteret County connection! I will be featuring your blog on my Follow Friday post. Hope you'll visit. Kristin, yes that second obituary is like a novel. LOL. Debra, wow thank you so much for including me in your Follow Friday Post. The genealogy community on Geneabloggers has been so kind. I too am glad to have found a Craven/Carteret County connection. Thanks again. While unpacking boxes in my office today, I came across Ellis' book, Historic Images of Havelock & Cherry Point (2010). There are photos of Dave Sampson on pages 40 & 41. Holy Cow! That's awesome! I think I may have to look into getting that book. Thanks for the heads up and also thanks for turning me on to the Rhine Girl blog. I found on her page today a link to Youtube and the videos of Charles R Hale.